1st day of the year. There are then 365 days left in 2020. 11th day of Winter. There are 79 days left till Spring. January 1, is the 8th of the 12 days of the Christmas Season (Twelvetide). January 1, 2020 is the 7th and last day of Kwanzaa. 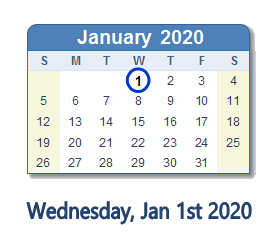 What happened on January 1st 2020?